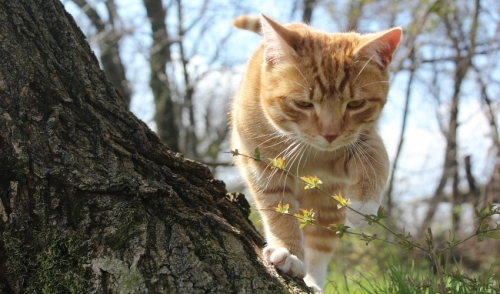 Share "Spring Pet Care Tips"
The seasons are changing quickly this year, which may leave us unprepared to contend with all the things that come with warm weather, especially if you're a pet owner. There are a few things you should keep in mind when caring for your pet this spring and into the summer months. Even with gas prices as inflated as they are, hopping in the car for a joy ride with your canine companion always comes to mind when the sun begins to shine. It is important to avoid leaving your pet in the car on hot days, even with the windows cracked. The interior of a car parked in the sun can reach upwards of 160 degrees, which can lead to brain damage or even death via heat stroke in your pet. While you're on your joy ride, avoid allowing your pet to hang its head out of the window. The wind can lead to ear infections, and debris may enter the eyes. When you've arrived home safely, be aware that sometimes antifreeze can leak from the engine of your car. Pets have been known to lap up this harmful fluid because of its sweet taste. Another liquid harmful to your pet's digestion is water. That's right, water. Not all water is safe for consumption by animals. If you wouldn't drink it, don't allow your pet to drink it. If you are going to the beach or will be near stagnant water, make sure to bring plenty of water for your pet. Drain any reservoirs such as tires from around your house to prevent your pet from taking a drink of water rife with bacteria. If you're going to be outdoors on a sunny day, give your pet the same sunscreen protection you provide yourself; pets can get sunburned too, especially around the nose and ears. Although it may seem as if you are helping your pet cool off, shaving its fur close to the skin will more likely lead to sunburn than relief from the heat. Any sort of lawn chemicals such as fertilizers, rodenticides, herbicides, or pesticides can accumulate in fur and be ingested while your pet is grooming itself. Keep your pets out of reach of these chemicals as well as any other dangerous lawn equipment such as mowers, hedge clippers and the like. There is an abundance of wildlife present in the spring. Monitor your animals, not allowing them out of sight for too long, especially near wooded areas to prevent interaction with wild animals that may carry disease or less harmful adverse effects, like a skunk’s spray. Exercise frequent screenings for fleas and ticks to mitigate the possibility of the transmission of tapeworms, Lyme, and other infections. Follow these tips and enjoy a fun and healthy spring season with your pets.